Bardejov's most prominent site of Jewish heritage is the so-called židovské suburbium [Jewish suburb], a compound of Jewish institutional buildings just outside the town center. It includes the Old Synagogue, a beit midrash [study house] and a mikvah [ritual bath]. A Jewish slaughter-house once stood nearby on the spot occupied today by a supermarket. The Old Synagogue [Old Shul], dating from 1836, is the compound's earliest building. Along with the synagogue in Stupava, it is one of only two surviving nine-bay synagogues in Slovakia. Constructed before Jewish emancipation, it is discreetly hidden at the rear of the compound’s lot. Its interior consists of a sanctuary with a vestibule, study-room, and women’s gallery attached on its western side. The sanctuary is a nine-bay space with a central bimah supported by four pillars and a ceiling covered with splendid ornamental decoration. The most interesting artifact is a Hebrew dedicatory plaque on the western wall above the entrance. Its poetic text provides information about the donor and the date of construction. The beit midrash, built in the late nineteenth century, served for Torah study and as a prayer hall. The ritual bath, dating from the same period, forms the front building of the compound, facing the street. There are two plaques on its façade, a Holocaust memorial placed there in 1992 and a plaque identifying the compound as part of the Jewish cultural heritage route. The židovské suburbium is undergoing gradual restoration by its owner, the Central Union of Jewish Communities in Bratislava. The Union adopted a double-track redevelopment plan for the site. Under this plan, considered to be the most effective strategy given the limited available funding, the depressed local economic situation and the small support from public resources, the compound was split into two. 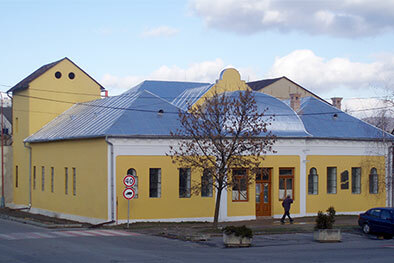 The Old Synagogue, long used as a warehouse for plumbing supplies, is currently under restoration and will eventually be used for cultural purposes. Most of the funding for this comes from the Central Union's own means, plus grants from foreign sources. The beit midrash and mikvah, meanwhile, are under long-term use agreement to be restored for commercial purposes as a metalware shop. The tenant is covering the entire cost of restoration from his own budget. Building use: The Old Synagogue is under restoration for cultural purposes. The beit midrash and mikvah are used as a commercial property. Hours: The Synagogue is closed. The commercial section of the compound is accessible during shop hours.